Tripping the Light Fantastic: I am back in DVF! I am back in DVF! Much has happened since I have been away - I clocked up nearly 70 hours of flying last month visiting Australia and Turkey. In between the resulting jet lag, work has been extraordinarily busy and I had more visitors to entertain as they passed through the city. Excuses aside, I am glad to be back and I look forward to regaling you with tales from my time away in posts to come. Now to the issue at hand - how wonderful New York is this time of year! The weather is milder than usual, Christmas is in the air, and most importantly, it's sample sale season! Although the Diane Von Furstenberg sample sale officially started yesterday, it was a not-so-secret secret that the venue would be open to the public the afternoon before (i.e. as soon as the press were done with their sneak peak). I rocked up to the sale shortly after 6pm on Monday and was in after a short wait. The selection was absolutely brilliant and the lack of crowds verged on luxurious. See here for photos of the racks, and also here for a hilarious video taken on the day 1 of the sale. I felt like I was swimming in a pool of wrap dresses so imagine the restraint I exercised by only leaving with one - which I promptly wore to work the very next day. Prices are reportedly slashed towards the final days of the sale though choices may be thin. If you are queue-averse like me, you can pick up this dress right here. I LOVE it!! You look beautiful. What a fantastic dress! The print reminds me a bit of the Dutch wrap I wore today on my blog (which was inspired in part by the knowledge the sample sale was coming up). So glad you got such an amazing score! I'm loving your new DVF dress. Looks great on you! The dress looks so pretty on you!! 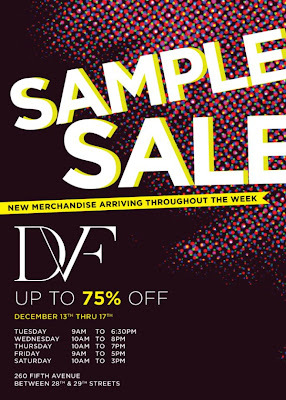 JG/M - DVF has sample sales so often I am confident you can time a trip up to the NY office real soon! Jess - Love the dress you wore! Kelly - THANK YOU for the Liebster award! I have been knocked out with a cold but I am looking forward to passing it forward! Kristin and Sayaka - THANK YOU for visiting!